School starts the day after tomorrow. In these last few days of summer, the kids and I are getting things done and having some fun. This morning I let them sleep late one last time (tomorrow I’ll yank them out of bed insanely early, as a dry run for Wednesday), and then made them pancakes. I also wrangled them into today’s make something project. While they feasted on pancakes, we brainstormed several emotions that show on the face: happy, sad, excited, surprised, cynical, bored … I wrote them on slips of paper, crumpled them, and tossed them in a large mug. 1. Hannah pulled the word “happy.” She wanted to involve a pet in her creation, so she grabbed a cat and swiped his paw in an arc through the powdered sugar dust (look closely, near the bottom of the plate) to make a smile beneath the two big, eyeball-like spaces where her pancakes had been. 2. 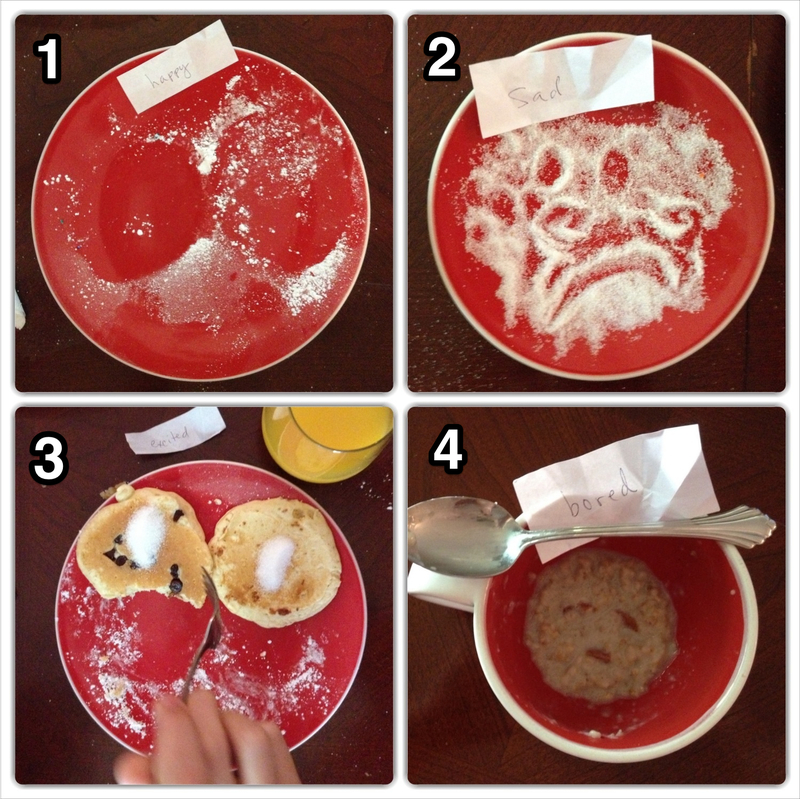 Emma got the word “sad.” Her plate was covered in granulated sugar (this was not a healthy breakfast), so she used her finger to etch in a couple eyes and a frown—then added her own flair by including a handlebar mustache. 3. Isaac, my growing teenage dude, ate eight pancakes this morning. Technically, what you see on his plate are not leftovers, because he cleaned his plate after completing this wide-eyed “excited” face. That’s his hand driving a fork back toward the food. I snapped the photo just before he obliterated the left eyeball. 4. I’m counting calories. So after I used up all the pancake batter and put away the chocolate and butterscotch chips, sprinkles, and sugars, I made myself a small bowl of steel cut oatmeal. For “fun,” I tossed in a few chopped pecans. When I’d had enough of my healthy meal, I fished around in the bottom of the bowl with my spoon to bring a few of those nuts to the surface, positioning them as narrow, down-turned eyes and a sorry little mouth. That’s some “bored” breakfast there, don’t you think?